NOVA was, as always, a blast. It was a couple weeks ago at this point, but I am already looking forward to next year and have it marked on my calendar. 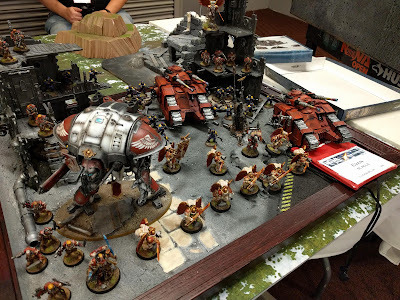 This year, as well as playing in the 40k GT for a sixth time, I also had the pleasure of playing in the Invitational for a third time. I am going to (somewhat) briefly run through my nine game over the course of the convention and give some highlights. What is up Everyone? In this episode, Evan and Chandler come together to talk about Evan's last minute preparations for the NOVA Invitational as well the GT. The guys start off talking about the Daunting Challenge that is Nick Nanavati. Evan talks about his thoughts on his list and the challenges it will face against Nick's list. They then break down the scouring system that NOVA has gone with this year, the round by round missions, and the challenges that his list will face in each mission. They also break down the scoring for the Primary, the Secondary, and the Tertiary and their thoughts on which ones work well for his list. We also break down Evan's lists and talk about the strengths of both lists in each of the tournaments. Evan goes round by round and talks about the challenges and success of each round. He had a great showing and talks about what he liked most about his GT list. Two in a WEEK? Must be a NOVA thing! What is up Everyone? In this episode, Evan and Chandler come together to talk about Evan's last minute preparations for the NOVA Invitational as well the GT. The guys start off talking about the Daunting Challenge that is Nick Nanavati. Evan talks about his thoughts on his list and the challenges it will face against Nick's list. They then break down the scouring system that NOVA has gone with this year, the round by round missions, and the challenges that his list will face in each mission. They also break down the scoring for the Primary, the Secondary, and the Tertiary and their thoughts on which ones work well for his list. We also break down Evan's lists and talk about the strengths of both lists in each of the tournaments. Tyranids, Gene Stealers, and Blood Angels! Hopefully Evan has a great showing.